HOWYWOOD KINDERGARTEN! : We are Fam-i-ly! Here's a simple idea you can start up anytime of year to strengthen the bond between home and school. 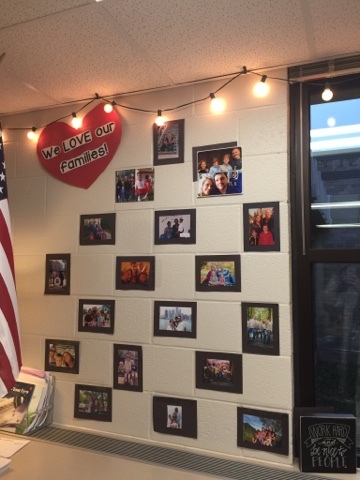 Invite families to send in a 4x6 family photo! I LOVE this wall and all that it symbolizes! I just cut a bunch of 6x8 black rectangles of paper and kept them handy and then as kids brought in pics, I mounted them on the black background (helps them all look the same size cause some sent in bigger or smaller pics) and popped them up on the wall. I did this at the start of the year and feel like it helped ease the transition between home and school. I had a few missing mom and they loved being able to see her picture if they wanted to. I also think it just sends powerful messages like: families are important, we care & want to get to know each other, families and classrooms work together, and so much more! Try it out any time of year and show them all you care!